Attic Restoration: If you've had animals living in your attic, (and this is the most common wildlife issue that I deal with) then you've got everything they've left behind in your attic. This includes nesting material and debris that they've brought in, food they've hoarded, and most of all, the excrement, urine, hair, and body oils that they leave behind. Most wild animals are not clean. I've seen enough filthy attics to know this. Raccoons will not only tear up your ducts and rip off your insulation paper, but they'll often leave big mounds of droppings. Opossums just poop everywhere indiscriminately, and I've seen attics that look like sewers. Rodents such as rats and squirrels can produce up to 40 droppings a day, and scatter the pellets all throughout your attic. And all of these animals of course urinate as well. Once I remove all of the animals from your attic and seal off all of the entry points, it's time to clean the attic. I accomplish this by removing all of the debris and the heavily soiled insulation, removing all of the large droppings by hand and vacuuming up the small droppings, and by spraying the attic with a special enzyme-based biological cleaner that makes use of non-pathogenic bacteria and enzymes to break down and digest any and all organic and biological waste, and disintegrate it and render it inert. This eliminates the biohazard in your attic, destroys the smell, and eliminates the odors that can attract new animals to your home. 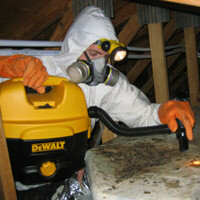 I consider attic cleanup a very important part of the wildlife control process - both for prevention and your health. Vacuum the Droppings: When and where possible, we vacuum up the droppings that the animals have left behind. This usually applies to the smaller droppings, such as those left behind by rats, squirrels, bats, and birds. These smaller animals have high metabolisms, and they produce dozens of droppings each day. Given the high numbers or rats or bats that can live in an attic, these droppings can really accumulate. I vacuum up the large quantities of droppings. I usually run a large commercial vacuum through the attic, but oftentimes I use a smaller vacuum such as seen in this picture to the left. The smaller unit allows me to travel to certain areas where my 50 feet of large vacuum hose won't go, and the smaller vacuum actually allows me to vacuum droppings off of fiberglass batt (precut rolled-out) insulation without sucking up the insulation. 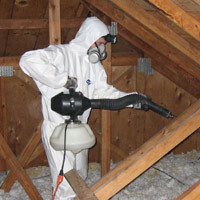 If the small droppings are within loose-fill (blown-in) insulation, then they cannot be vacuumed. 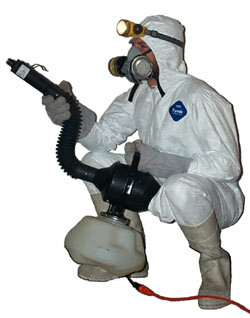 In this case, the insulation should be replaced, or the cleaner will destroy and disintegrate the remaining droppings. Here are some photographs of animal feces in attic so that you can identify which type of critter you have. Removal of Animal Waste: If you've had a large animal in the attic, most commonly a raccoon or an opossum, then the large droppings should be removed by hand. In the photo to the right, I'm removing opossum droppings from an attic. Some animals really make a toilet out of an attic! Animal waste on this scale really causes an odor problem. It's also a health risk - raccoon droppings are known to sometimes contain raccoon roundworm, the eggs of which humans can breath in and become infected by. I'm not a real expert on zoonotic diseases - those transferrable from animals to people. However, I do know that many such diseases are transmitted via animal waste, such as Campylobacter infections, leptospira infections, and salmonella infections. These infections can cause often-severe gastrointestinal symptoms or even kidney damage or brain and spinal cord infection in the case of leptospira. Other symptoms vary widely but can include high fever, severe headache, chills, muscle aches, vomiting, abdominal pain, diarrhea, and so on. Attic Fogging: The animals that live in your attic run through the insulation, often tunneling under it, they run on the wooden beams, the pipes, the wires, everything. They often leave behind their droppings and urine everywhere, not to mention the greases and oils from their fur. Most animals actually scent mark their territory - your attic. Rats are notorious for leaving behind urine and pheromone scent to communicate with other rats. Our BioShield fogging destroys all of these biological agents. We not only eliminate the biohazard associated with wild animal feces and urine, but we destroy the odor that serves as a chemical signal to other animals. I use a high-powered electric fogging machine that blasts out a fine mist of the cleaning agent, and gets in every last nook and cranny. The whole attic is fogged by the time I am done. The BioShield agent is not harmful to people or pets, nor does it cause any damage to any part of the attic - insulation, wooden beams, wires, and so on are safe, and cleaned. This spraying is an important part of a total wildlife control solution. If you don't live in Florida click my Nationwide Directory of Wildlife Professionals serving almost every town, in all 50 states.